Ecology, Evolution, and Behavior Ph.D.
/ Marie-Anne de Graaff, Ph.D. Broadly our lab studies how changes in climate and land-use affect ecosystem processes that drive the global carbon cycle. We are especially interested in the question of how plant roots and soil microorganisms interact to affect soil carbon and nutrient dynamics. Collaborators: Julie Jastrow (ANL), Johan Six (UC-Davis), Geoff Morris (University of South Carolina) Funded by USDA-NIFA. Land use change for bioenergy production can create substantial green house gas emissions through removal of standing vegetation and disturbance of soil carbon pools. With this project we assess: (1) whether shifting C3-dominated nonnative perennial grasslands to C4-dominated native perennial grasslands repay the carbon debt of land-use change by increasing soil carbon sequestration within the early years of establishment; (2) whether increased variation in root traits in species and cultivar mixes of native perennial grasses will enhance biomass production, soil carbon storage and the efficiency of nitrogen (N) cycling (i.e., decrease N losses); and (3) whether energy gain resulting from an increase in soil carbon storage and yield, along with a decrease in nutrient inputs and losses in low-input diverse mixtures of perennial grasses, is sufficient to offset energy gain from relatively greater biomass production in high input monocultures of perennial grasses. It is uncertain which factors control the temperature sensitivity of litter decomposition. This study aims to examine how decomposition-induced changes in the quantity and quality of litter through time affect the temperature kinetics of decomposition processes. Collaborators: Dr. Erika Marin Spiotta (UW-Madison), Dr. Asmeret Berhe (UC-Merced), Dr. Joe Mason (UW-Madison). Funded by NSF Geobiology and Low Temperature Geochemistry. This project will test the potential for deep buried soil organic matter to become a carbon source in response to changes in climate or land use that affect the connectivity of buried soils to the atmosphere. The research aims to understand (1) how soil burial contributes to the persistence of carbon in the form of soil organic matter and (2) whether exposure to surface conditions can trigger the decomposition of ancient carbon. 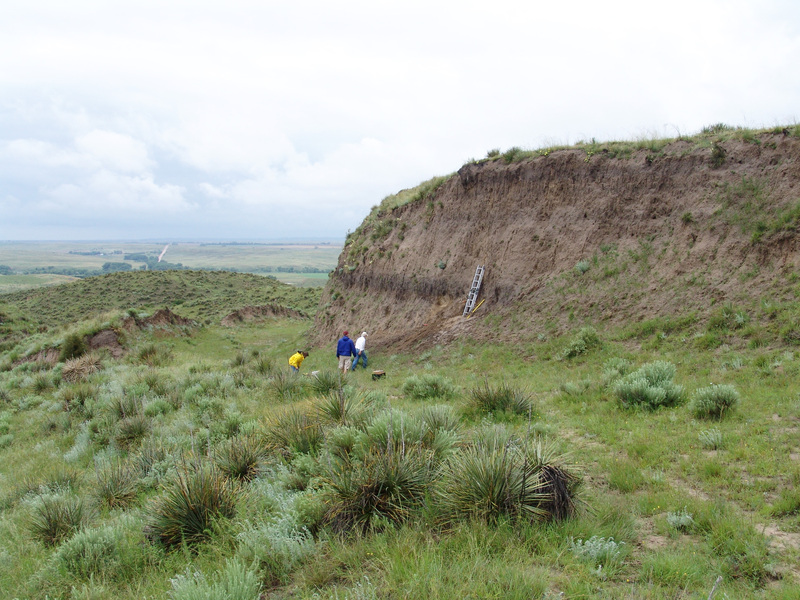 The proposed study site is located in the U.S. Great Plains, where climate-driven loess deposition during the late Pleistocene and Holocene resulted in sequences of buried soils in thick loess deposits. The vulnerability of ancient organic matter to changing environmental conditions will be measured in two ways. First, changes in organic matter age, composition and bioavailability will be quantified along eroding and depositional field toposequences, where the paleosol exists at varying degrees of isolation from the modern landscape surface. Second, laboratory manipulations will measure the effects of carbon substrates, nitrogen availability, and microbial composition on ancient organic matter decomposition and mobilization in gaseous and dissolved forms. This study combines a geomorphic approach drawing from paleoclimatic reconstructions with advanced geochemical, spectroscopic and metagenomic techniques to generate new knowledge on environmental controls on carbon biogeochemistry. Sagebrush is an obligate mycorrhizal species. Cheatgrass invasion may reduce mycorrhizal abundance and change their communities, thereby complicating sagebrush restoration success. With this study we aim to investigate how arbuscular mycorrhizal fungi (AMF) communities and abundance differ between sagebrush and cheatgrass dominated ecosystems, and how invasion by cheatgrass affects plant performance and carbon allocation to AMF in sagebrush seedlings. Sagebrush steppe occurs widely across the Western United States covering nearly 500,000 km2 across the western US and Canada. Much of the sagebrush steppe of the northern Columbia Basin of Washington is degraded and fragmented. In addition, fire frequency has increased from between 50 to more than 300 years to less than 10 years. Fire can contribute to changes in soil structure which can alter soil microbial communities and the processes they control, such as nutrient cycling. These changes alter plant-soil feedbacks, and can transition the system into a new state comprised of a drastically different plant community that cannot sustain the native community of organisms that was once supported by sagebrush. With this study we set out to evaluate how fire recurrence in sagebrush ecosystems of the northern Columbia Basin affects soil structural and functional properties (i.e. enzyme activities, soil nutrient cycling) that are critical to plant communities. Birds and bats are important “top-down” predators that provide helpful ecosystem-services such as pollination and predation on herbivorous-insects. Increasing human activities such as noise-pollution associated with energy development are altering bird and bat presence, which could impact ecosystem services, with effects evident across many trophic levels (predators-insects-plants-soil). Since 2014 we quantify the cascading effects of noise-pollution using an experimental approach wherein we broadcast recorded natural-gas-compressor-station noise in sagebrush steppe sites. We study how experimental-noise affects bird and bat abundance and behavior, and how experimentally-induced reduction in predation impacts herbivorous-insect presence and damage, plant physiology, and leaf litter chemistry and decomposition. The DIRT (Detrital Input and Removal Treatments) experiments were started in 1956 at the University of Wisconsin Arboretum by Dr. Francis Hole, a soil scientist who wanted to examine the effects changing litter inputs on soil organic matter dynamics. Despite the critical roles played by soil organic matter (SOM) within ecosystems, in the global C cycle and in the Earth’s climate system, controls on SOM balances in ecosystems remain poorly understood. Temperature, soil mineralogy, and land management all play a role in the balance between SOM stabilization and destabilization, but the degree to which plant litter quality and quantity affect soil C sequestration is less well known. To address this knowledge gap, the international DIRT network was established to assess how rates and sources of plant litter inputs control the long-term stability, accumulation, and chemical nature of soil organic matter in forested ecosystems over decadal time scales. Sites span climatic and soil gradients. Leslie studies how fire impacts plant-soil relationships in the Sage Steppe ecosystem. Abby studies the vulnerability of deep soil carbon to decomposition. Jenn studies how aboveground biodiversity in bioenergy cropping systems affects belowground ecosystem biodiversity and functioning. Megan studies how intra specific variation of root traits in switchgrass cultivars affects soil carbon stabilization. Mariah studies how restoration practices affect soil microbial functioning in Sage Steppe ecosystems. James studies effects of fire on plant-soil interactions in the sage steppe. Karina studies biotic and abiotic controls on decomposition processes in the sage-steppe. Violet studies how aboveground biodiversity in bioenergy cropping systems affects belowground ecosystem biodiversity and functioning. Bennett AE, Preedy K, Golubski A, Umbanhowar J, Borrett SR, Byrne L, Apostol K, Bever JD, Biederman L, Classen AT, Cuddington K, de Graaff M-A, Garrett KA, Gross L, Hastings A, Hoeksema JD, Hrynkiv V, Karst J, Kummel M, Lee CT, Liang C, Liao W, Mack K, Miller L, Ownley B, Rojas C, Simms AL, Walsh VK, Warren M, Zhu J. (2018) Beyond the Black Box: Identifying mathematical tools for elucidating interactions in soils. In review. Dashti H*, Glenn NF, Mitchell JJ, Ilangakoon NT, Spaete LP, Qi Y, Ustin S, Flores A, de Graaff M-A (2018) Remote sensing of nitrogen in shrublands: impacts of canopy structure and background soil from a multi-scale study. In review. Delvinne H*, Feris K, de Graaff M-A (2018) Substrate availability drives the temperature response of soil organic carbon decomposition in semiarid ecosystems. In review. de Graaff M-A, Kardol P, van Diepen L, Throop H (2018) Effects of agricultural intensification on soil biodiversity and implications for ecosystem functioning: a meta-analysis. In review. Dierks J*, Denef K, van Diepen L, de Graaff M-A (2018) Cheatgrass-associated AMF community negatively affects sagebrush root production but not C transfer to the soil. In review. Adkins J*, Jastrow JD, Morris GP, de Graaff M-A (2018) Effects of fertilization, plant species, genotypic diversity on soil carbon in biofuel cropping systems. In review. Pacioretty MT*, Martinez M*, Cinto Meija E*, Reinhardt K, Barber J, de Graaff M-A, Kahaware AY, Aho K (2018) Experimental exclusion of insectivorous predators results in no responses across multiple trophic levels in a water-limited, sagebrush-steppe ecosystem. Journal of Arid Environments, in revision. Djukic I, Kepfer-Rojas S, Kappel Schmidt I, Steenberg Larsen K, Beier C, Berg B, Verheyen K, TeaComposition (including de Graaff M-A) (2018) Early stage litter decomposition across biomes. Science of the Total Environment 628,1369-1394. Campos X*, Germino M, de Graaff M-A (2017) Enhanced precipitation promotes decomposition and soil C stabilization in semiarid ecosystems, but seasonal timing of wetting matters. Plant and Soil 416, 427-436. Kardol P, Throop HL, Adkins J**, de Graaff M-A (2016) A hierarchical framework for studying the role of biodiversity in soil food web processes and ecosystem services. Soil Biology & Biochemistry 102, 33-36. Adkins J**, Jastrow JD, Morris G, Six J, de Graaff M-A (2016) Effects of switchgrass cultivars and intraspecific differences in root morphology on soil carbon stabilization. Geoderma 262, 147-154. Morris GP, Hu Z, Grabowski PP, Borevitz JO, de Graaff M-A, Miller RM, Jastrow JD (2015) Genotypic diversity effects on biomass production in native perennial bioenergy cropping systems. Global Change Biology Bioenergy (DOI: 10.1111/gcbb.12309). de Graaff M-A, Adkins J**., Kardol P, Throop HL (2015) A meta-analysis of soil biodiversity impacts on the carbon cycle. Soil 1, 257-271.
de Graaff M-A., Throop H.L., Verburg P.S.J., Arnone J.A., Campos X. * (2014) A synthesis of climate change and vegetation cover effects on biogeochemical cycling in shrub dominated drylands. Ecosystems 5, 931-945. Smith A.P. *, Marin-Spiotta E., de Graaff M-A., Balser T.C. (2014) Microbial community structure varies across soil organic matter aggregate pools during tropical land cover change. Soil Biology & Biochemistry 77, 292-303. De Graaff M-A., Jastrow J.D., Gillette S., Johns A. **, Wullschleger S.D. (2014) Differential priming of soil carbon driven by soil depth and root impacts on carbon availability. Soil Biology & Biochemistry 69, 147-156. De Graaff M-A., Six J., Jastrow J.D., Schadt C.W., Wullschleger S.D. (2013) Variation in root architecture among switchgrass cultivars impacts root decomposition rates. Soil Biology & Biochemistry 58, 198-206. De Graaff M-A., Schadt C.W., Six J., Schweitzer J.S., Rula K.**, Classen A.T. (2011) Elevated CO2 and plant species diversity interact to slow root decomposition. Soil Biology & Biochemistry, 43, 2347-2354. De Graaff M-A., Castro H., Classen A.T., Garten C.T. Schadt C.W. (2010) Root exudates mediate plant residue decomposition rates by regulating the microbial community structure. New Phytologist, 188, 1055-1064. De Graaff M-A., Six J., van Kessel C. (2009) Rhizodeposition-induced decomposition increases N availability to wild and cultivated wheat genotypes. Soil Biology & Biochemistry, 41, 1094-1103. Hungate B.A., van Groenigen K.J., Six J., Jastrow J.D., Luo Y., de Graaff M-A., van Kessel C., Osenberg C.W. (2009) Assessing the effect of elevated CO2 on soil carbon: a comparison of four meta-analyses. Global Change Biology, 15, 2020-2034. De Graaff M-A., Six J., van Kessel C. (2008) The impact of long-term elevated CO2 on C and N retention in stable SOM pools. Plant and Soil, 303, 311-321. De Graaff M-A., Six J., van Kessel C. (2007) Elevated CO2 increases rhizodeposition and microbial immobilization of root-derived nitrogen. New Phytologist, 173, 778–786. de Graaff M-A., van Groenigen K.J., Six J., Hungate B., van Kessel C. (2006) Interactions between plant growth and soil nutrient cycling under elevated CO2: a Meta-Analysis. Global Change Biology, 12, 1-15. Van Kessel C., Boots B., de Graaff M-A., Six J. (2006) Soil C and N sequestration in a grassland following 10 years of Free Air CO2 Enrichment. Global Change Biology, 12, 1-13. Van Groenigen K.J., Six J., Hungate B., de Graaff M-A., van Breemen N., van Kessel C. (2006) Element interactions limit soil carbon storage. Proceedings of the National Academy of Sciences, 103, 6571-6574. De Graaff M-A., Six J., van Kessel C. (2006) Prolonged elevated atmospheric CO2 does not affect decomposition of plant material. Soil Biology & Biochemistry, 38, 187-190. Van Groenigen, K.J., de Graaff M-A., Six J., Harris D., Kuikman P., van Kessel C. (2005) The impact of elevated [CO2] on soil C and N dynamics: a meta-analysis. In: Nösberger J, Long SP, Norby RJ, Stitt M, Hendrey GR, Blum H, eds. Managed Ecosystems and CO2 Case Studies, Processes and Perspectives. Berlin Heidelberg, Germany: Springer-Verlag, 373-388. De Graaff M-A., Six J., Harris D., van Kessel C. (2004) Decomposition of soil and plant carbon from pasture systems after 9 years of exposure to elevated CO2: impact on C cycling and modeling. Global Change Biology, 10, 1922-1935. I’m happy to receive applications for graduate school. If you like to apply, please write me a short letter outlining why you are interested to work in my lab, how your interests would contribute to the research (see descriptions above) in the ecosystem ecology lab and why you want to go to graduate school. Thanks for your interest!